The Carrisa Holly was developed from Ilex cornuta ‘Rotunda’ and has been know to revert back to this. Ilex cornuta ‘Carrisa’ is an outstanding dwarf Chinese Holly because of its dense growth habit and small leaves, this Holly only reaches 3 feet tall and 4-5 feet wide. 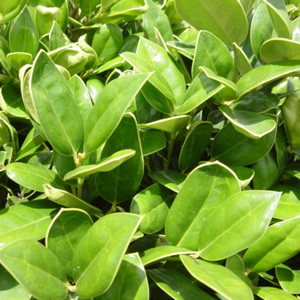 Has small, dark, glossy green leaves cupped slightly upward with one spine on the tip. Carrisa Holly produces no berries.